After reading about His Holy Quitter, Pope Benedict XVI's exit in a Popecopter earlier today, the Jalopnik staff was, of course, talking about Popemobiles and the like. At that moment, I started to notice some strangely familiar things about the Pope. Who else was it that I knew of that had special cars and helicopters named after him? He also lives in a big mansion, has his presence announced in the sky occasionally (not white smoke, but with some kind of projection). I think there's people out there who follow his every move with reverence as well. What's that guy's name? 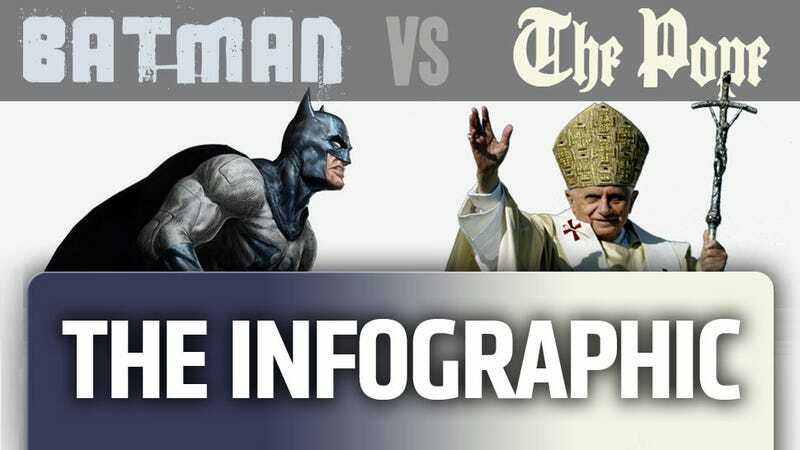 So, based on this realization, I decided to make a handy chart, so we can all see just how close Batman and the Pope are. I hope this helps. You may want to print one out small and keep it in your wallet for reference. I'll admit, I'm also a bit curious to see in the comments which group ends up being more offended by the comparison, Batmaniacs or religious Catholics. Really, though, these groups should be pretty well in sync: with Christian Bale stepping down, they need a new Batman as well as a new Pope. Maybe there's some synergy to be explored here?